Magda Szabó was my teacher,” the elderly lady with snowy white hair told me, as she pulled a copy of The Door from a shelf and held it out for me to examine. The manner in which she handed me the book suggested that she thought I better buy it, so I added it to the two books that I was already carrying—Antal Szerb’s Journey By Moonlight, and an illustrated children’s book called Something’s Always Happening To Me by Éva Janikovsky. The Door was to be my introduction to Szabó, who, as I was to learn, is to Hungary what Margaret Atwood is to Canada. Sitting there, though, clutching that particular copy of The Door, in the aptly named Litea: Literature & Tea Bookshop in Buda’s Castle District, I was a few months away from realising how significant Szabó’s work is. Hungary celebrated Szabó’s 100th birth anniversary on October 5, 2017. A momentous day, the lady in the store assured me. That precise moment, though, the hot September sun had thoroughly exhausted me. Fortunately I was in a lovely cross between a bookstore and a tea house, which meant that as the proprietress set about getting my order of tea and cake ready, I had a chance to reflect on a long, but eventful day exploring Budapest on a trip that was entirely unplanned. 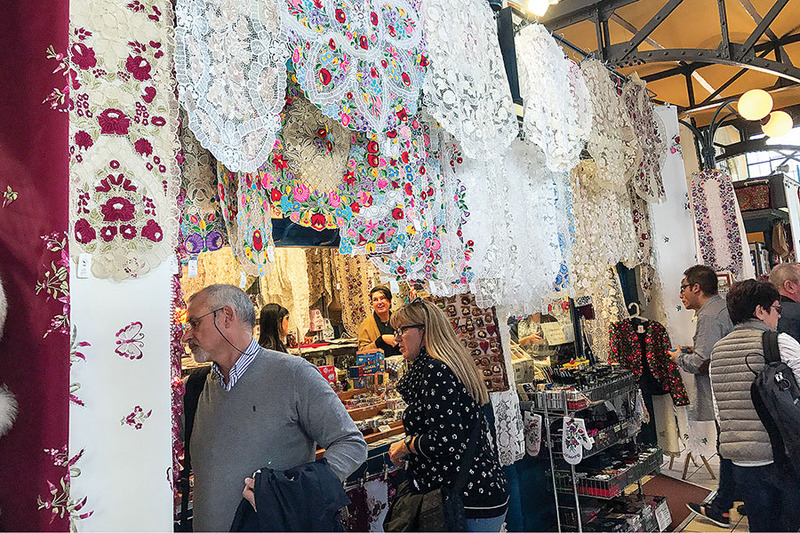 That morning, I had left my hotel and boarded a quaint underground train hurtling towards Kálvin Square, which is a short walk away from Budapest’s Great Central Market Hall. Had I known just how great the Great Central Market Hall—Budapest’s oldest and largest indoor market—is, I might have prepared myself better. Perhaps with more comfortable shoes and a full stomach to deal with the walking that awaited me. But since it was a little late for regret, I had no choice but to walk through those double doors into the seemingly endless aisles. The ground floor of the hall was teeming with people that Friday. 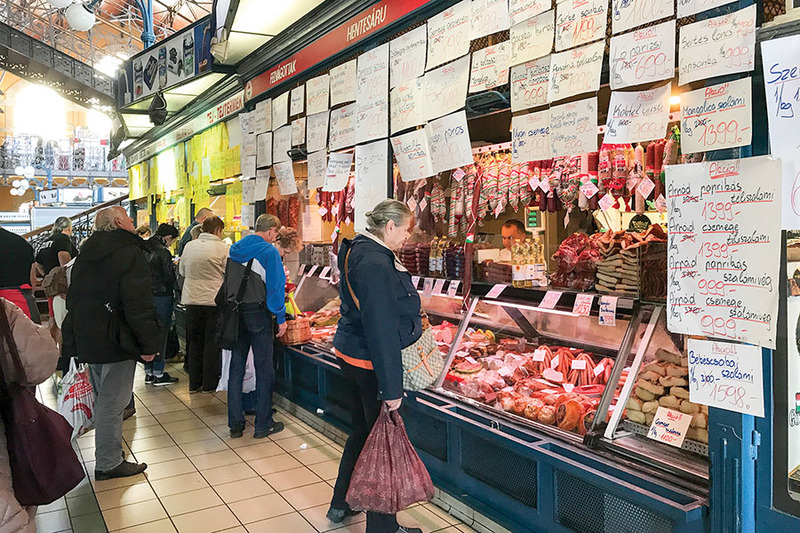 It appeared that it wasn’t just a place for tourists to wander through; instead it was full of locals completing their shopping ahead of the weekend, weaving in and out of the stalls that sold meat, poultry and vegetables. What attracted me, though, were the stalls selling Hungarian salami and mangalica sausages (made with meat of the mangalica pig, which is typical to Hungary). Storekeepers were kind, offering me samples. Others tried explaining, in broken English, the finer points of a truly good Hungarian salami. And still more called out, asking me to try what they had on offer: There was the famous Hungarian garlic cream, and, when I turned a corner, Hungarian paprika—smoky, sweet, mild, hot, powdered, whole, and every other kind you could imagine. My most prized purchase, however, was a mix of spices that would, the storekeeper assured me, conjure up the most authentic Hungarian goulash, a dish I’m rather partial to. The forints practically climbed out of my wallet and into her hands of their own accord. The upper floor of the market was even more packed, with clearly more tourists. There was every manner of Hungarian souvenir: Matyo embroidery, traditional clothes, tablecloths, hand-forged knives, Hungarian lace and porcelain, painted eggs, handcrafted wooden boxes that couldn’t be opened unless you knew the secret to opening them, and popular multi-coloured puzzle cubes that a certain Hungarian named Erno Rubik invented. When I walked out of the market, I had far fewer forints than when I had entered. But I couldn’t help feel fondly for Károly Kamermayer (the first mayor of Budapest), who decided to build the huge marketplace. Outside once again, and sufficiently fortified by food and drink, both sampled and purchased, I was ready to take on a little more of Budapest. A stroll up the road from the market led me to the banks of the Danube. And, what is a trip to Budapest without a glimpse of the Danube? After all, it was the Danube that separated the hilly Buda from the flat Pest, with several bridges linking the two, combining them to form Budapest. Liberty Bridge was brimming with tourists that day, some of whom were agile enough to climb onto the deck in the quest of better views and photos. For me, just standing on the bridge was enough. There was something remarkable and frightening about standing in the middle of a bridge that straddled such powerful a river. I looked up, past the green suspender cables at the golden Turuls—the falcon-like mythical bird that forms an important part of Hungarian architecture—and felt a little light headed. Budapest was slowly, but steadily, proving to be more lovely than I had imagined, and I was, as yet only in Pest. Buda, I’d been told, might cause the hapless tourist, to exhibit signs of Stendhal Syndrome. So, deciding that the view of the Citadella and Gellért Hill was enough from where I’d been standing, I chose not to go any closer. I walked back across the bridge to Pest, and continued walking along the Danube. The stroll by the river allowed me to marvel at the stark contrast between the two sides of the twin city. It almost seemed like Buda, even when viewed from a distance, with its many hills and neo-Gothic and neo-Roman architecture, was shrouded in mysteries of the past. Pest, on the other hand, had taken a step into the present, although portions of it were historic. Some of the more modern parts of the city were, dare I say, a little prosaic. 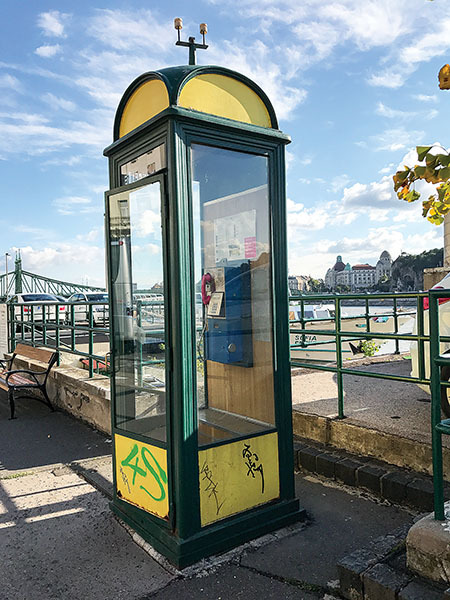 I found myself passing by relics of the past, like the green and yellow telephone booths, and reminders of the city’s more bloody history and the atrocities of World War II, such as the memorial ‘Shoes on the Danube’ that represents the many people murdered on the banks of the river. It was strange to be in a city that, while so beautiful, also had such a painful past. I was jolted out of my reverie when I reached the Deák Ferenc tér intersection, and nearly got run over by a person on a Segway. The Deák Ferenc tér was one of the city’s more prominent squares, dotted with restaurants and cafes, like the majestic Cafe Gerbeaud. But, with only a day to take in as much of the city as possible, I chose to admire the cafe from the outside, after which I found myself a bus that would take me to Buda. For the third time that day, I crossed between Pest and Buda, with the bus trundling across Elizabeth Bridge, heading for Castle District. 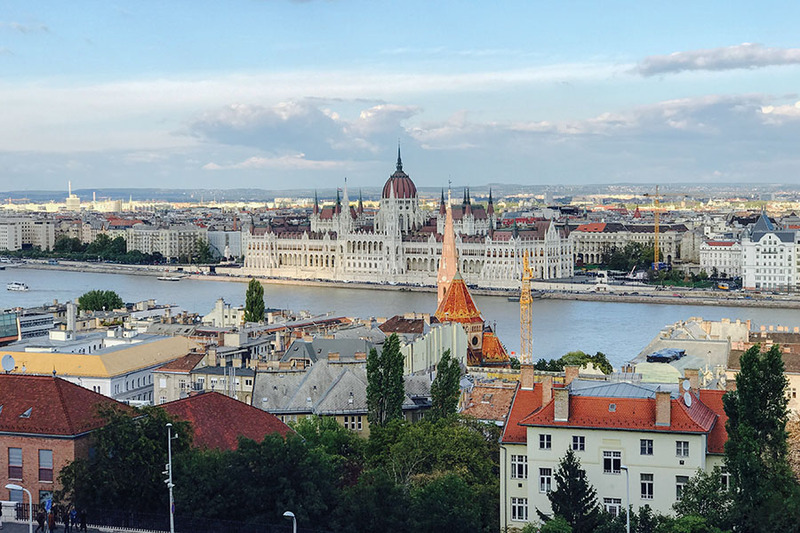 As we wound our way through the many picturesque streets that went higher and higher into Buda Hills, I was treated to a view of the Danube on one side, and the Buda Castle on the other. Although the castle was an impressive building, it was the Fisherman’s Bastion that I really wanted to see. It had captured my imagination years ago when I’d first seen photographs of the labyrinthine structure built into the hillside, with its seven stark white neo-Gothic towers and turrets, each representing one of the seven Magyar tribes that settled in the Carpathian Basin. 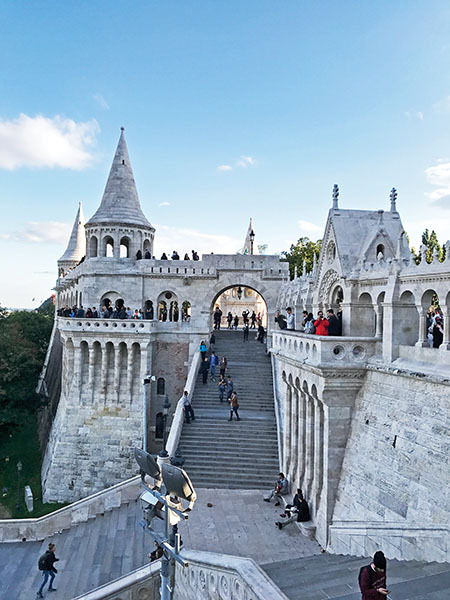 Standing on the terrace of the Bastion, or in one of the turrets, you can take in a panoramic view of Budapest, with everything from Gellért Hill to Margaret Island, and Budapest’s many bridges visible. But perhaps the most breathtaking sight of all was that of the majestic Hungarian Parliament Building in Kossuth Square: It was striking in the daylight and breathtaking by night. When I stumbled back into the Square of Holy Trinity, I got a better glimpse of Matthias Church, a Romanesque church that stands in front of Fisherman’s Bastion. Across from it, glinting in the sunlight, is a statue of Stephen I, the first king of Hungary. Standing in front of the church, whichever direction I chose to turn, there was something spectacular to look at, including a miniature bronze replica of the church itself. It was there that I first had a sense of just how much history Budapest has. And it was history in the truest sense—monuments from various epochs and time periods, all still around for the modern-day selfie stick-toting tourist to see. But it was only a month later, when I finished reading Journey By Moonlight that I fully understood what it must have been like for someone to grow up in the Buda Hills; and the full import of the effects of the wars that ravaged Europe in the first half of the 20th century on a city like this. Budapest, like many other European cities, has had to rebuild itself constantly. It’s a city of contrasts. A city that straddles the old and the new, if not with ease, with strength and character. I spent the remaining time that I had wandering through Buda Hills, where quaint restaurants jostled for space with big fashionable hotels, tiny artists’ studios stood next to what appeared to be residential buildings, and where, nestled in the courtyard of one such building I found the delightful Litea bookstore. When I had left the hotel, it was with a sense of abandon. Which is why I had chosen to skip a few places like the famed Széchenyi Thermal Baths, St Stephen’s Bascilica, and Hösök Ter. Wandering off the beaten path had led me to Litea, that had, in turn, led me to the works of Szerb and Szabó. I felt an immediate affinity with Szabó when I read those words. And along with it came a sense of gratitude for unexpected journeys, conversations with strangers, and for the magical way in which life sometimes unfolds. And gratitude also for the way in which twin cities, nestled on the banks of a majestic river, can result in just so much writing.